Harvard researchers raise the possibility that it's a probe sent by extraterrestrials. Scientists have been puzzling over 'Oumuamua ever since the mysterious space object was observed tumbling past the sun in late 2017. Given its high speed and its unusual trajectory, the reddish, stadium-sized whatever-it-is had clearly come from outside our solar system. But its flattened, elongated shape and the way it accelerated on its way through the solar system set it apart from conventional asteroids and comets. Now a pair of Harvard researchers are raising the possibility that 'Oumuamua is an alien spacecraft. As they say in a paper to be published Nov. 12 in The Astrophysical Journal Letters, the object "may be a fully operational probe sent intentionally to Earth vicinity by an alien civilization." The researchers aren't claiming outright that aliens sent 'Oumuamua. But after a careful mathematical analysis of the way the interstellar object sped up as it shot past the sun, they say 'Oumuamua could be a spacecraft pushed through space by light falling on its surface — or, as they put it in the paper, a "lightsail of artificial origin." "It is impossible to guess the purpose behind 'Oumuamua without more data," Avi Loeb, chairman of Harvard's astronomy department and a co-author of the paper, told NBC News MACH in an email. If 'Oumuamua is a lightsail, he added, one possibility is that it was floating in interstellar space when our solar system ran into it, "like a ship bumping into a buoy on the surface of the ocean." 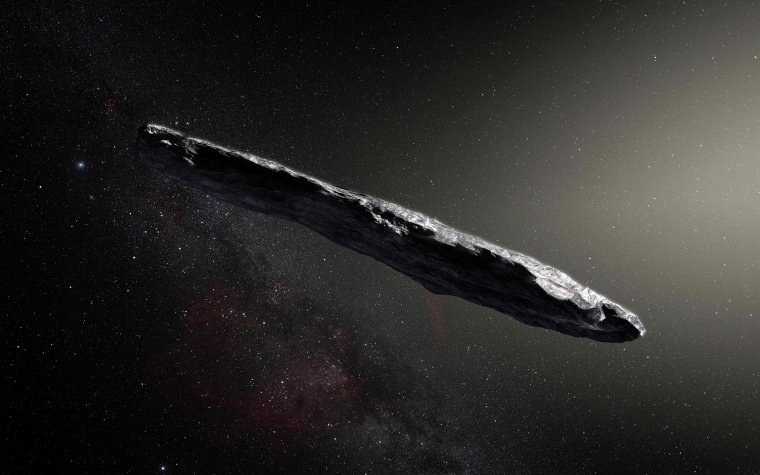 "It's certainly ingenious to show that an object the size of 'Oumuamua might be sent by aliens to another star system with nothing but a solar sail for power," Seth Shostak, a senior astronomer at the SETI Institute in Mountain View, California, said in an email. "But one should not blindly accept this clever hypothesis when there is also a mundane (and a priori more likely) explanation for 'Oumuamua — namely that it's a comet or asteroid from afar." Bailer-Jones, who earlier this year led a group of scientists who identified four dwarf stars as likely origin points for 'Oumuamua, raised questions in particular about the object's tumbling motion. The truth may be hard to establish, as 'Oumuamua has left the solar system and is no longer visible even with telescopes. In any case, Loeb said, the fact that we've observed one interstellar object like 'Oumuama suggests that others may be out there — and astronomers should begin a search for them. "A survey for lightsails as technosignatures [of extraterrestrial civilizations] in the solar system is warranted," he said, "irrespective of whether 'Oumuamua is one of them." WANT MORE STORIES ABOUT EXTRATERRESTRIALS?